Boleigh is one of the better fogous with a main passage over 10m long. It is not well marked on the map and is situated in the garden of a private house (be sure to ask). A few votive offerings surround the entrance. Books refer to the ‘god of the fogou’ a shallow, engraved carving on the left hand portal stone but spotting this is well-nigh impossible. The main entrance is elegant and faces south west. A stream runs through the small valley beyond this view. Inside, the main passage is clear and there is standing room. Wear boots for the far end is often wet. 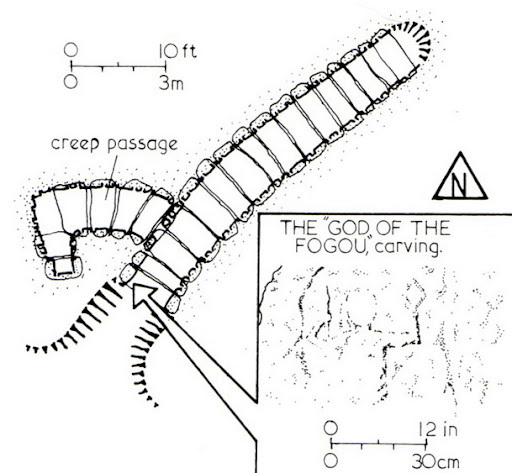 The entrance to the creep is close to the main entrance of the fogou itself and has a stout and accessible arch, leading to a small chamber full of very large spiders and a few strips of votive cloth. The creep exit has the usual upward slope, this time into a small beech copse .